Efficiency is rowing’s Holy Grail. And while a lot goes into making the stroke feel “light” at pace, the road to efficient rowing requires finding a rate that works for you. Stroke-rate pyramids are helpful for determining the sweet spot where you are able to row well and still maintain an aggressive race cadence. Remember to not carry your blade too high off the water as you ready it for entry. Start by rowing at full pressure at 24 strokes per minute, raising the rate two beats every 10 strokes. Continue until you feel your technique starting to break down and then drop the rate by two strokes per minute and hold that pace for a prolonged period of time. For another 2k tempo-setting workout, perform eight 500-meter pieces at your 2,000-meter pace. Granted this is far from scientific, but if you can maintain roughly the same time for each 500, you should be able to hold that pace for 2,000 meters. If not, consider dialing back your 2k pace expectations. 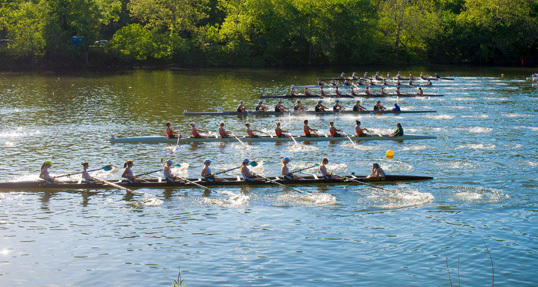 The catch is another critical aspect of the rowing movement that affects efficiency. Remember to not carry your blade too high off the water as you ready it for entry—doing so compromises length and, ultimately, boat speed as the blade is rowed in and the drive is initiated when the boat is moving slower. The bottom edge of the blade should be just clear of the water by the time it is fully squared. Video recap of the 2016 USRowing Youth National Championships. Take a look at the recap video from the 2016 Royal Canadian Henley Regatta at St. Catharines, ON, Canada (July 30 - August 2). In its 134th year, international competitors and visitors from across Canada, the US, Europe, Australia and Latin America participated.